Bali, 1 April 2014 - Recently on last Saturday, March 22nd 2014, Archipelago International gave back to Bali's beautiful environment by undergoing their annual beach cleanup event. 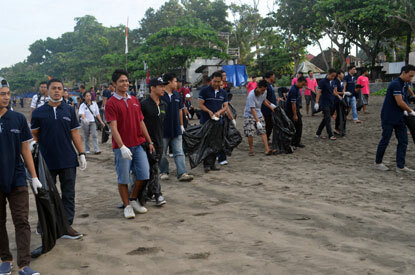 Lead by Nyoman Bagiartha, Regional Executive Housekeeper at Archipelago International, the beach cleaning took place on Saturday, 22nd March 2014 at Seminyak Beach. The event started at 06:45a.m through to 09:00a.m, and it was attended by approximately more than 100 Housekeepers from Archipelago International's Bali hotels & villas. Aesthetics. The natural landscape should remain pristine, as it once was. Health. Trash and organic debris attract vermin and other disease carrying vectors. This could not only affect humans, but marine life as well. Economic. Local small businessmen near the sea depend on visitors for their livelihood. Dirty beaches mean less people and less business. Social. People need places for recreation and beaches are a wonderful source for swimming, surfing and sun bathing for locals and tourists alike. “With a number of hotels and villas in Bali, it is our responsibility to preserve the beauty of the Island of the Gods. It is our duty to pay attention to the environment, and we inspire our team to maintain and care for Bali's ecosystem, and to pass on this spirit to their friends and family.” Says Winston Hanes, Regional General Manager Archipelago International.